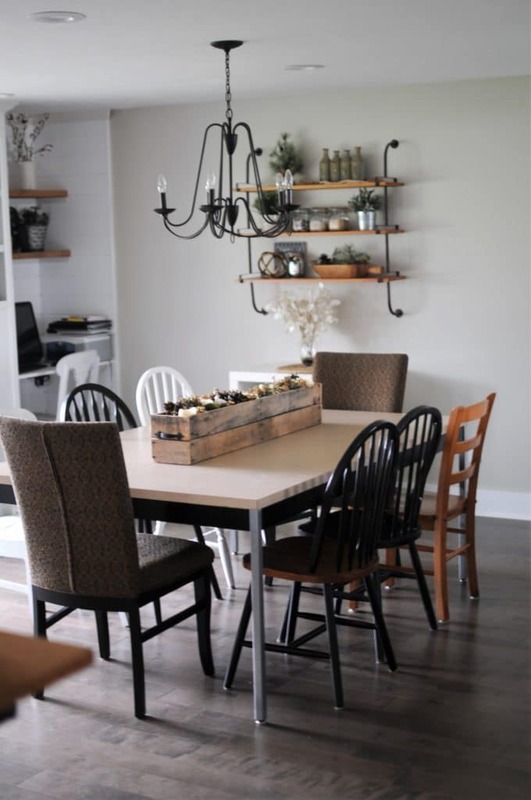 Joyful Derivatives » Blog » Our Projects » Blush & Moody Dining Room Makeover – ORC Week 6 – The REVEAL! 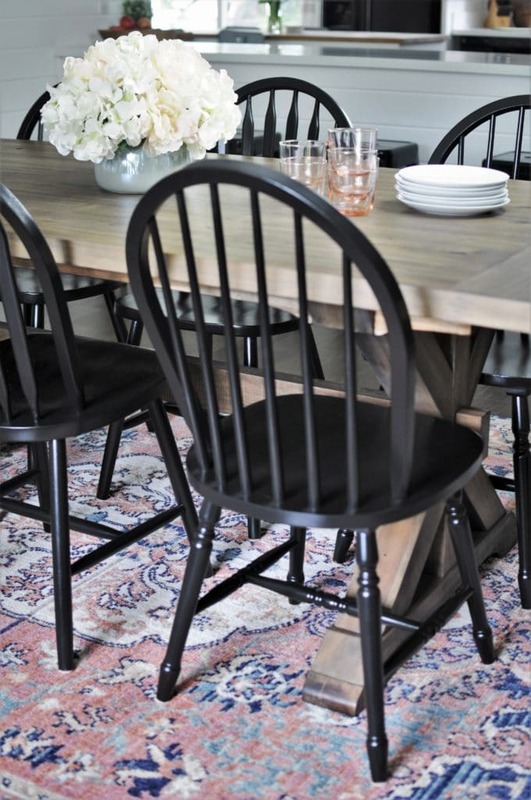 Blush & Moody Dining Room Makeover – ORC Week 6 – The REVEAL! 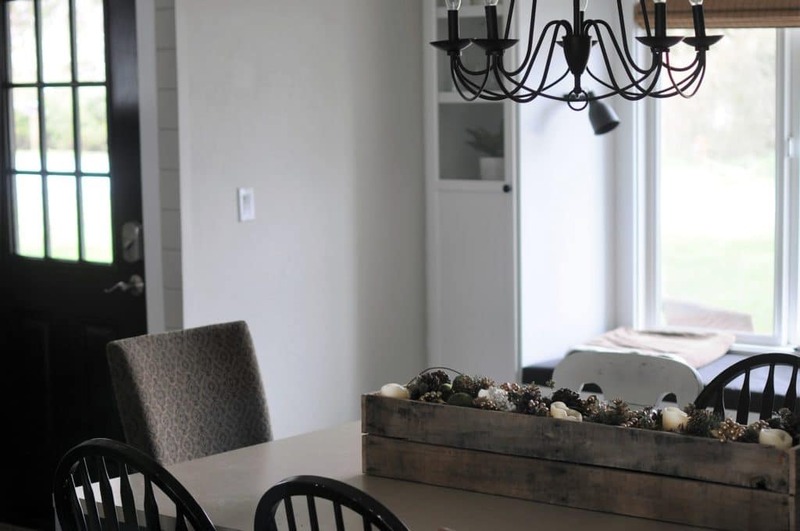 This project was especially neat for me because it was primarily cosmetic changes (rather than crazy, wall-removing, demo-heavy construction like most of our projects have been) and so it really allowed me to be creative with the styling and re-engage with my love for design. 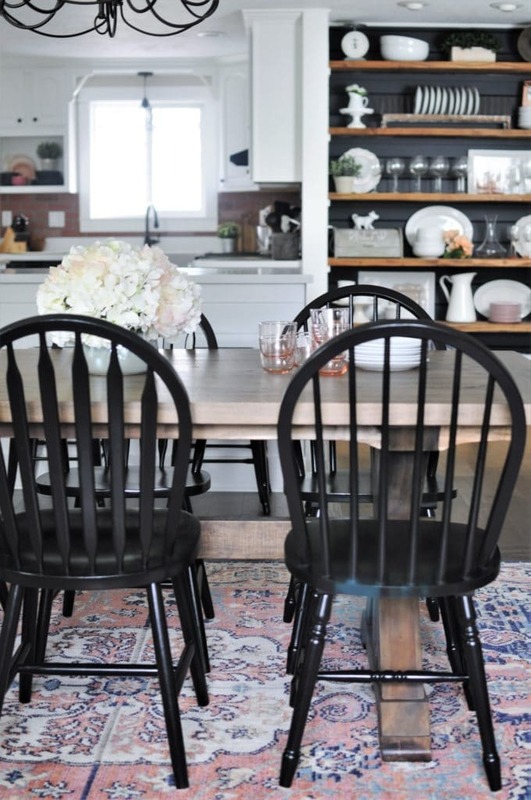 The rug is bolder than anything I’ve ever put in our home (which I’m obsessed with, by the way) and we took some fun risks with things like high-contrast black paint in the open hutch and above the white shiplap. There are so many fun pieces to the design and just I can’t wait to share them with you! 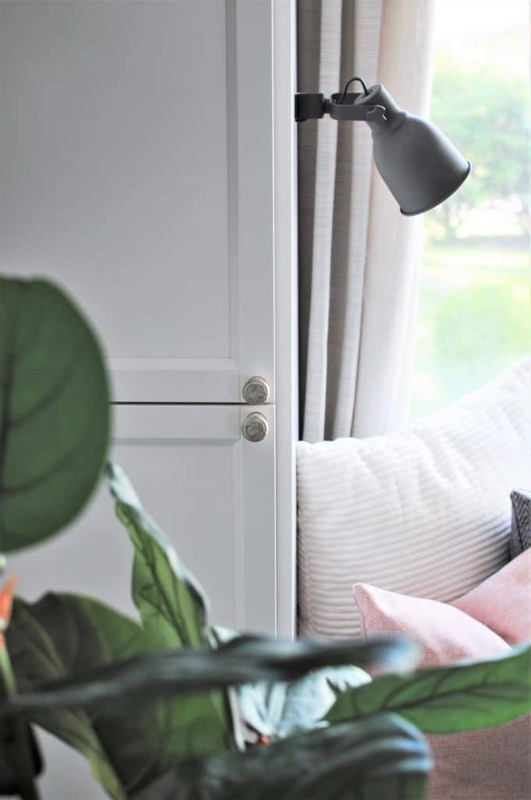 If this is the first you’ve heard of the ORC, I am honored to introduce you to a fabulous bi-annual event for interior design bloggers! 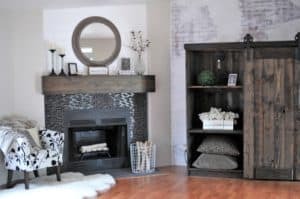 It happens every April and October, and is hosted by Linda at Calling it Home and House Beautiful. 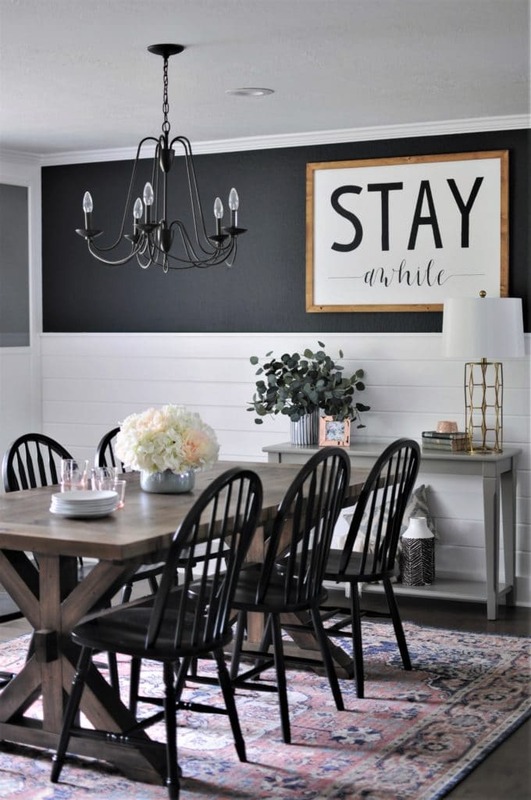 During the 6-week season, designers from all over North America come together to support each other as we all work our way through a room makeover! There are 20 featured designers, as well as over a hundred guest participants (including me!) who link up their makeovers and cheer each other on. 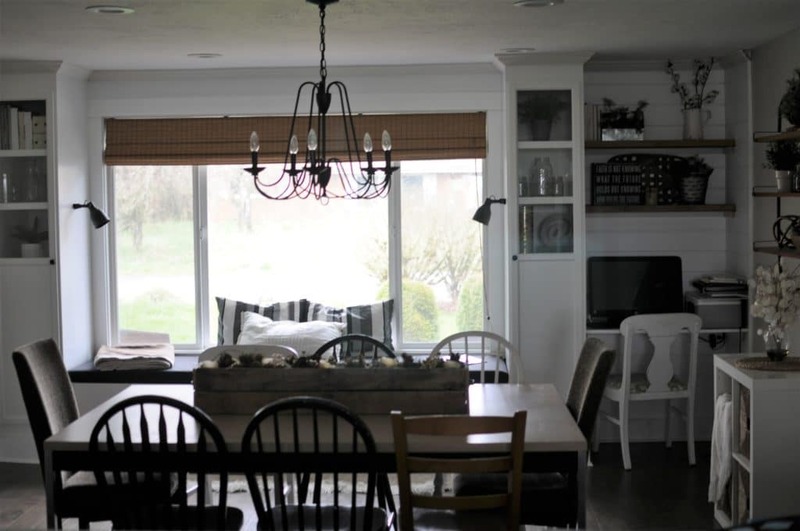 Last fall, we did our master bathroom and this season we did our dining room! You can also watch a “before” video tour here and a week 2 progress video tour here. I’ve sourced all the items I can below the pictures, as well as at the end of the post. 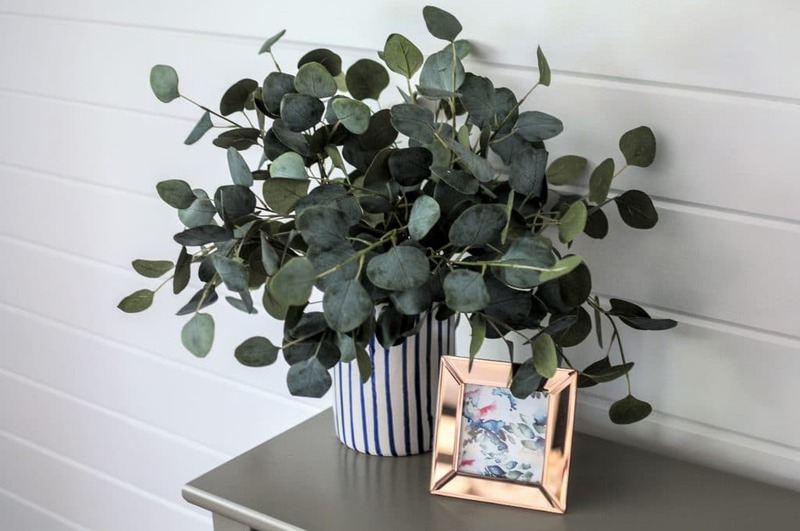 If you don’t see a link for the item you like, it’s probably because it’s something I thrifted or got on clearance so they’re no longer available. If you are joining me from the ORC site, welcome! 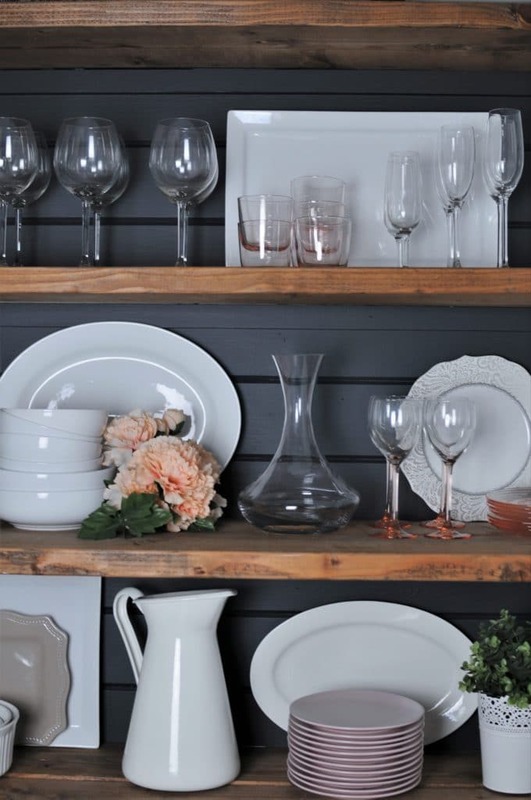 I’m Rachel Joy – DIY addict, home renovator, and self-taught interior designer. 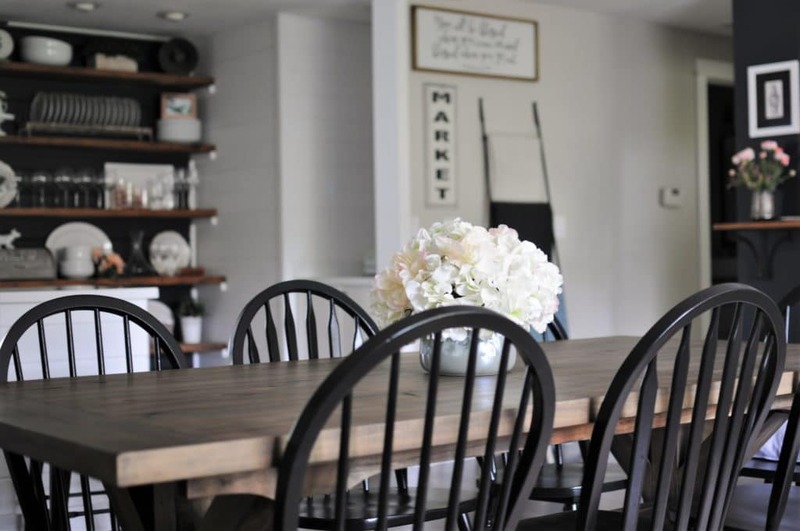 Through this blog, I strive to help others discover the ease and fun of decorating on a budget. I’m so glad you’re here! Are you ready to see what it looks like now?? Won’t you stay awhile? 🙂 I may have gone a little overboard with the pictures, but I couldn’t help myself! Enjoy the tour, my friend. 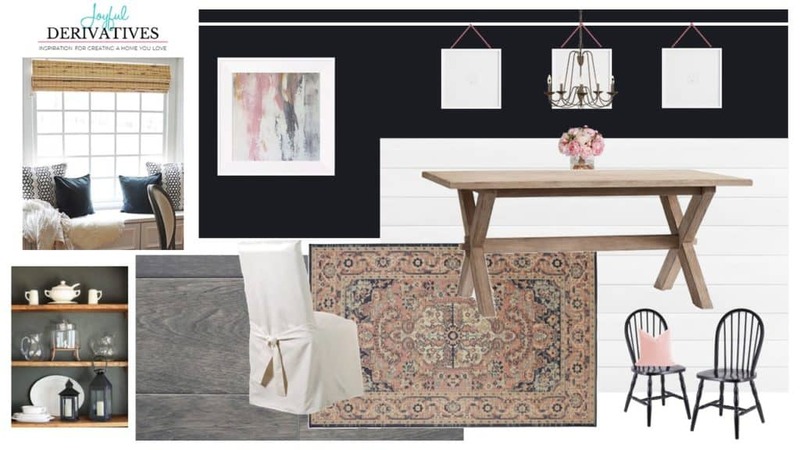 I was initially wanting to put a sideboard or buffet along this shiplap wall, but with the way the rug ended up centered in the room, I didn’t have much space to work with. 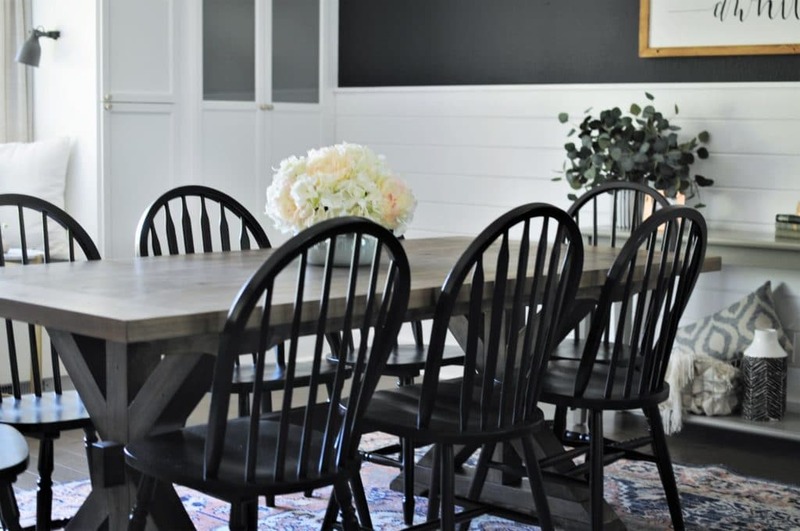 Thus, this narrow console table came out of storage and got a fresh coat of grey paint to match our lower kitchen cabinets. 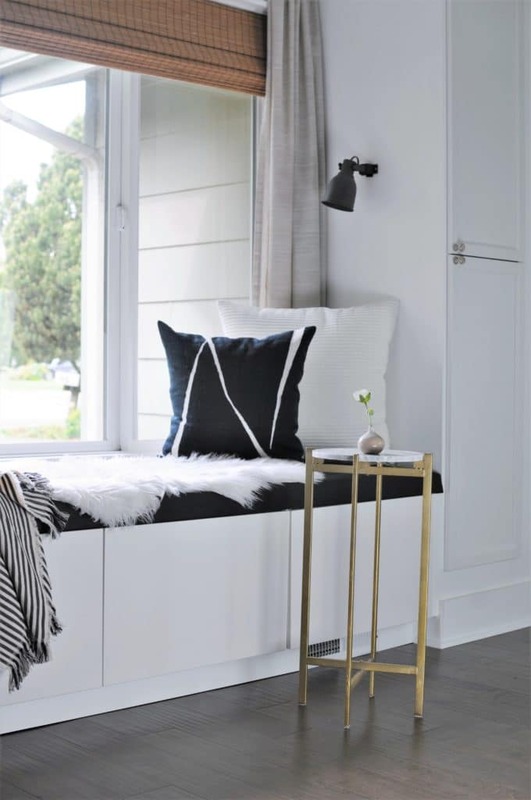 I like that the open bottom paired with the see-through lamp help the space to still feel open and airy. The window seat is now one of my favorite places to relax in our home. I added the little marble and gold side table (which is really a plant stand!) as a spot to rest a drink or phone. 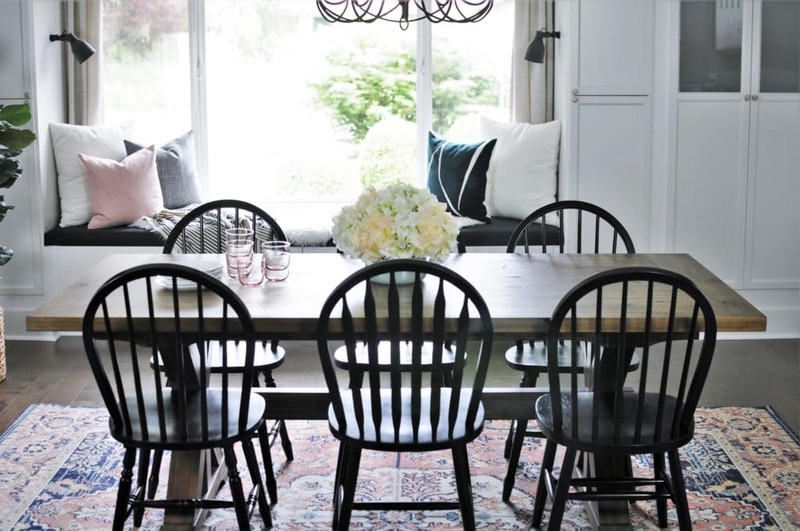 I love all the natural light that comes in here! 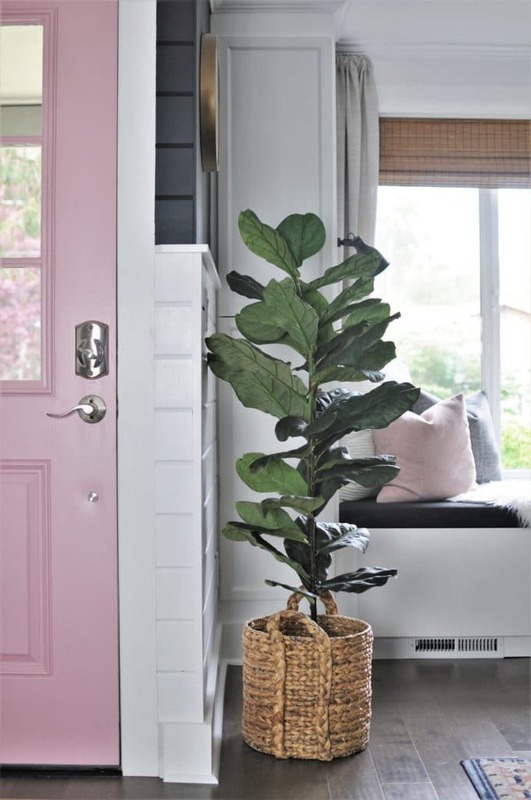 Say hello to my PINK DOOR! 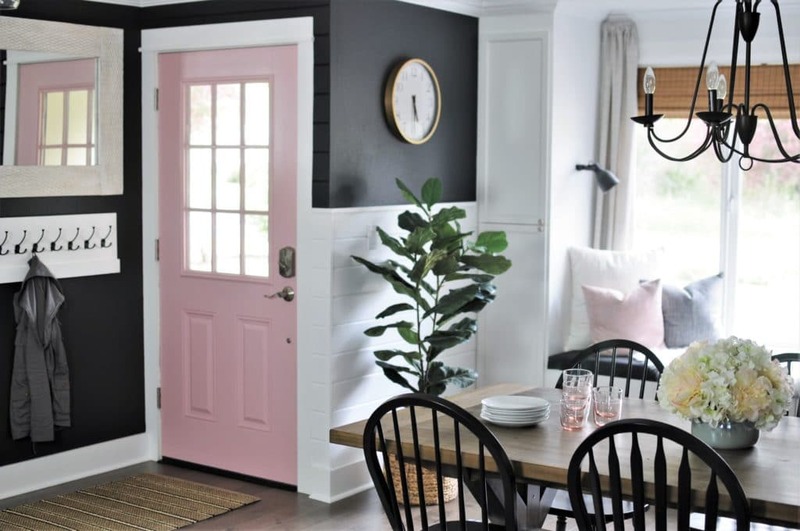 I am so glad we decided to paint it this playful pop of color – and the way it highlights the simple pink accents throughout the rest of the room is seriously dreamy. 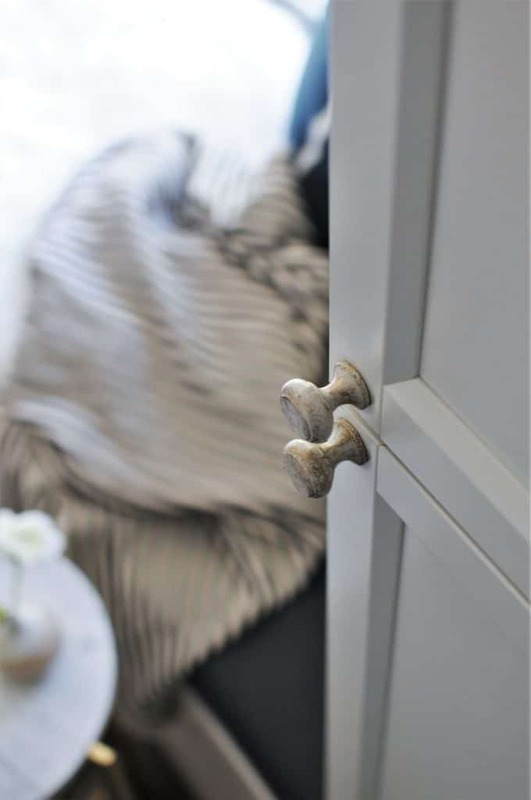 I’m a huge fan of using small details, like these brushed gold knobs on the built-ins, as pretty finishing touches in a room. 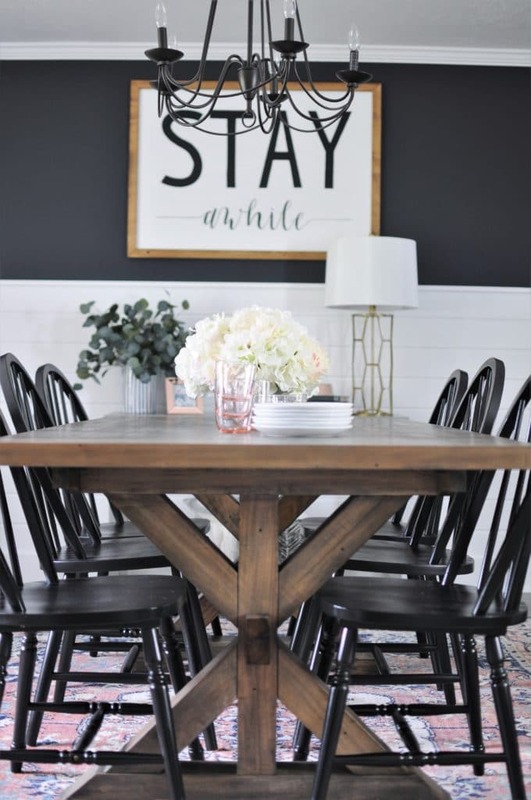 As you can see, the dining room really is the “hub” of our home. The entryway leads into it, the hallway goes out one direction, and the kitchen is just on the other side of the peninsula. 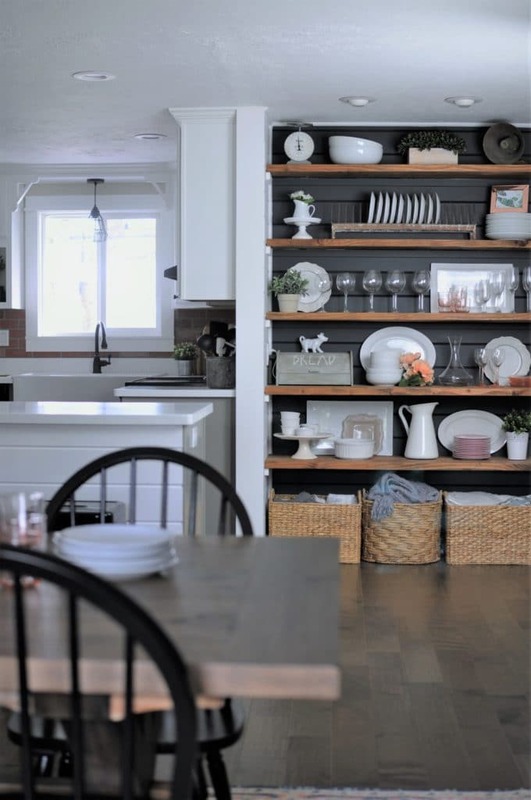 I painted the same black on the backside of my built-in hutch to continue the dark contrast all the way around the room. 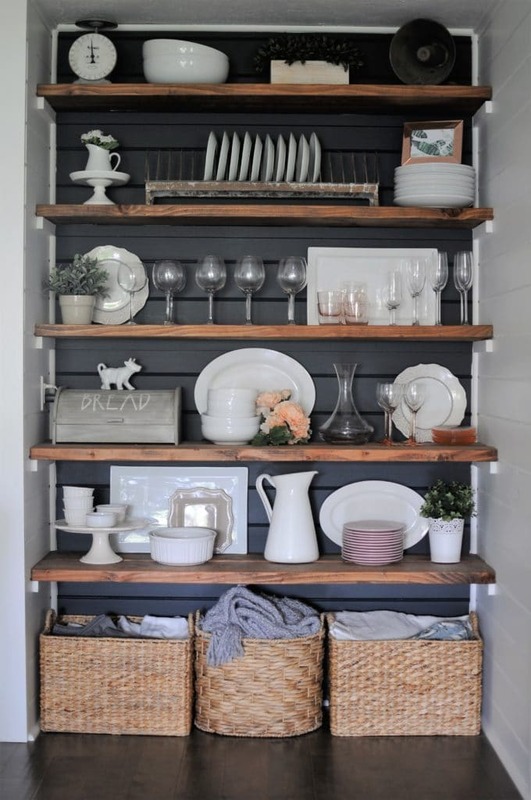 I love how it accentuates my white dishes and draws the eye in. 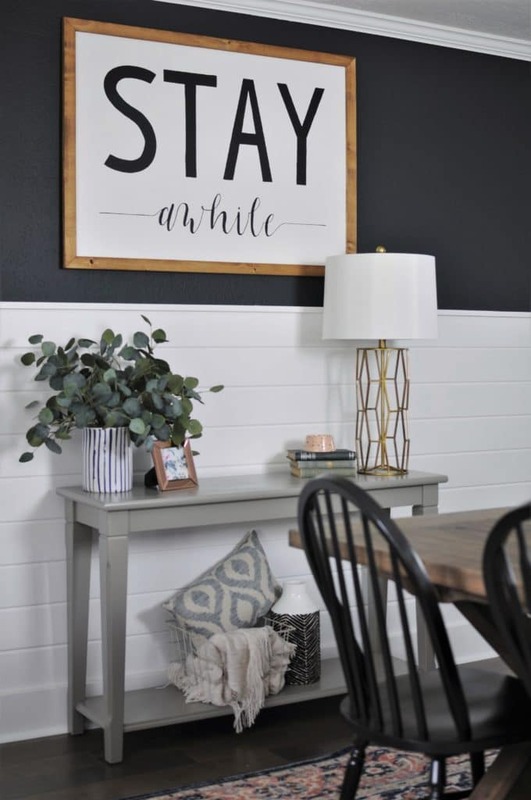 The “STAY awhile” sign was a DIY and ended up being hand-painted by a Starbucks barista I met last week! When I went in for coffee, I noticed she was drawing a neat chalkboard sign for the store, and so as I got my drink I asked her if she’d be interested in painting a sign for us. Chris and I built the sign and then she painted the words on it. I love when a collaboration is both spontaneous and successful! 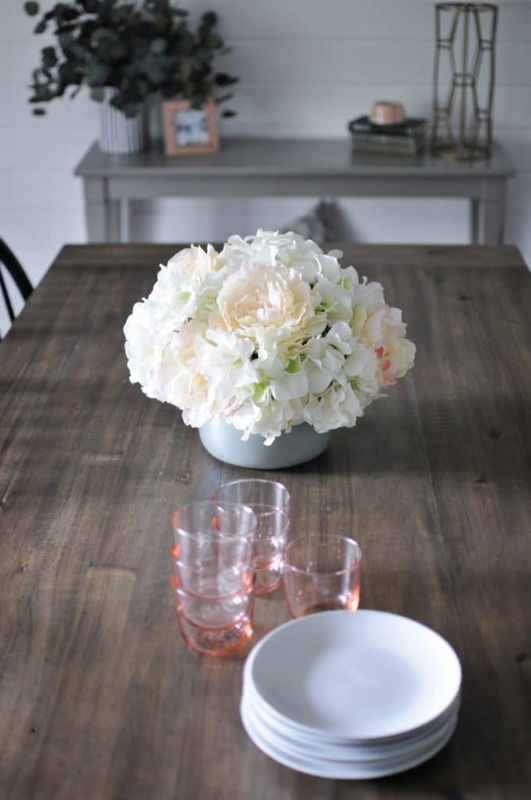 The dining table arrived just in the nick of time and ended up being PERFECT for the space. 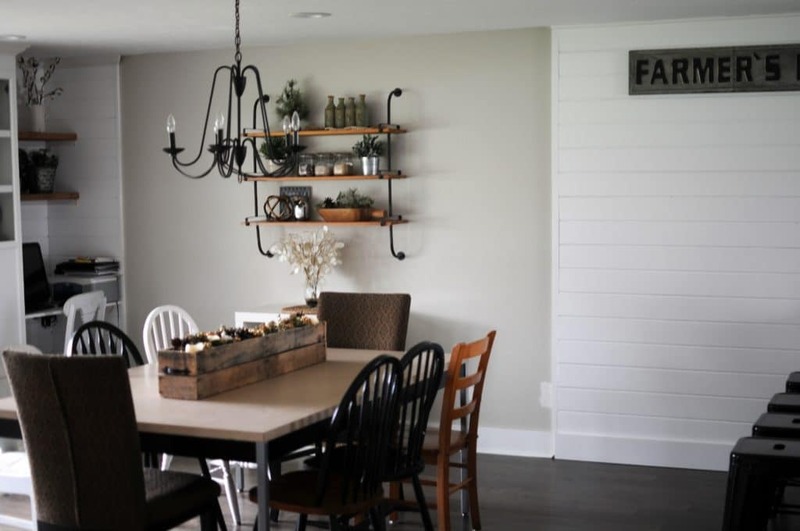 Its modern farmhouse style, with the “X” legs and rustic coloring, ties in really nicely to the rest of our home’s decor, as well as the classier parts of this space. 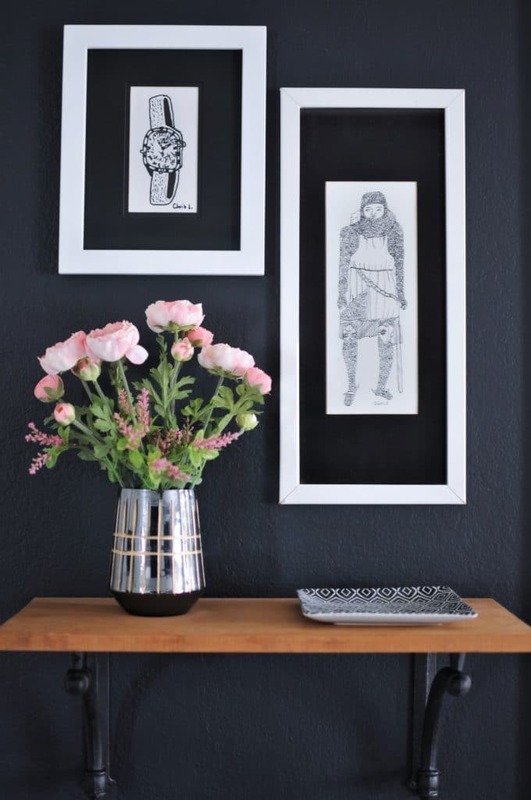 The black and white drawings in the entryway are super special because they were actually hand-drawn by my husband when he was 10! They even have the labels on the back of them from when they were entered into a drawing contest. 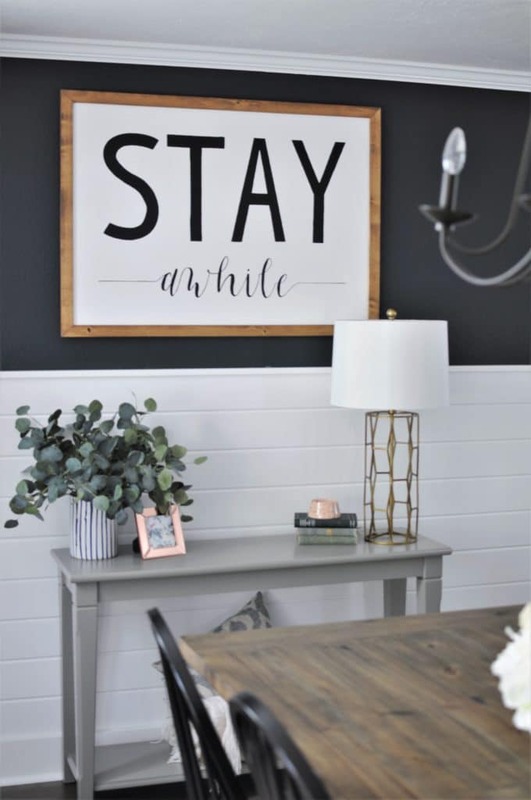 I love adding personal touches like this to our home. 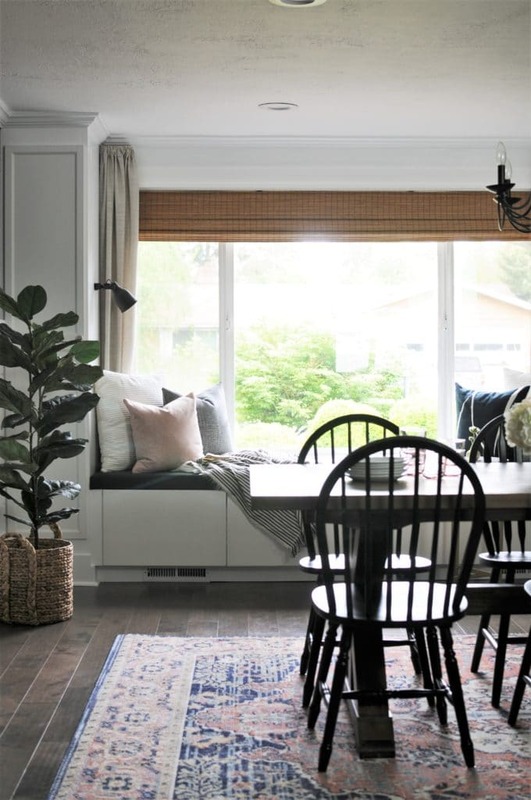 One thing that pleasantly surprised me about the changes we made to the built-ins, was the fact that adding closed cabinet doors on the towers flanking the window seat actually make the space feel bigger and brighter! The glass-topped doors (reused on the right with frosted glass) always felt dark (even when filled with pretty decor) because we didn’t have lights in them and they were 24″ deep. It was kind of like a cave effect! But now that the cabinets on either side of the window seat are fully closed and all bright white, the space feels so bright and welcoming! And the frosted glass doors on the right look really nice too. I like the flush front on the built-ins now. Isn’t the rug fabulous? 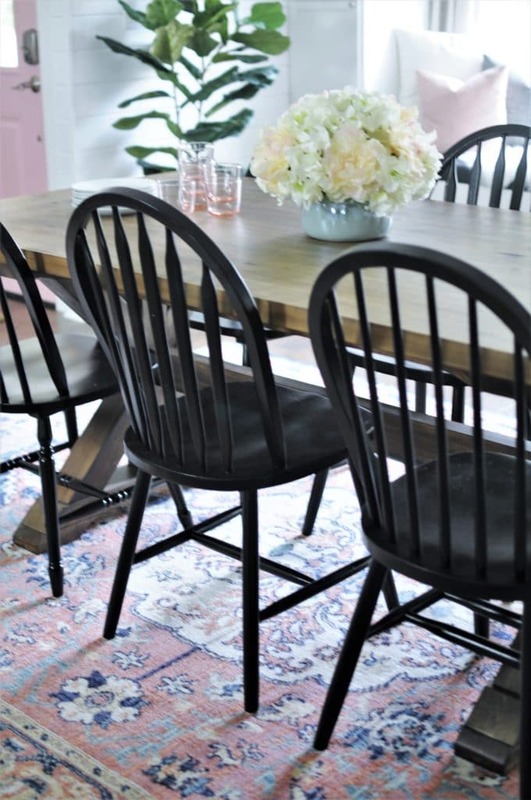 I love the variety of pinks, blues, creams and greys it has in it and the way it really ties everything in the room together. 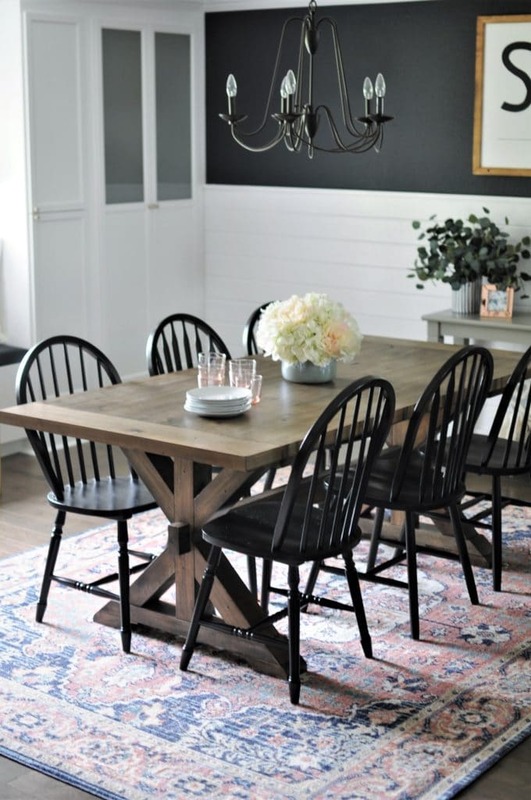 We purchased and installed the chandelier just a few months ago, and its simple black curves go perfectly in this space with the rounded black chairs and the black metal bar stools. 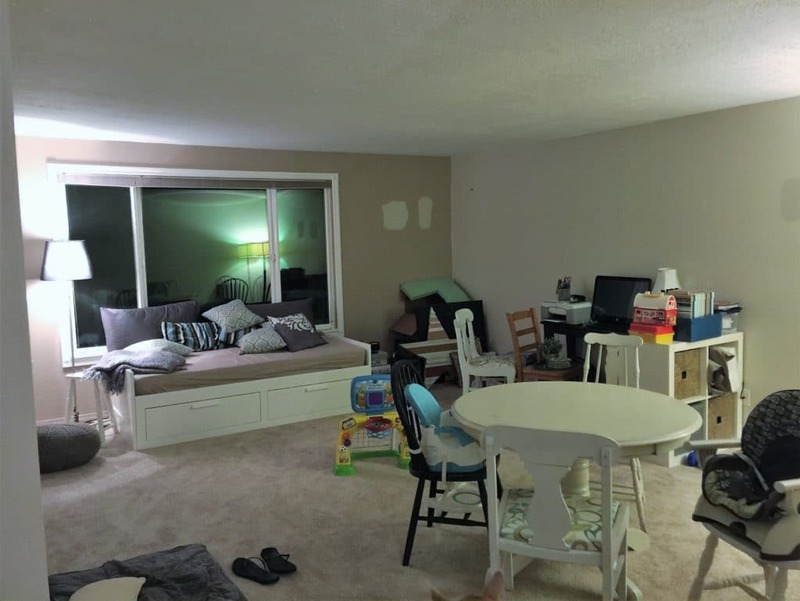 Can you believe it’s even the same room?? 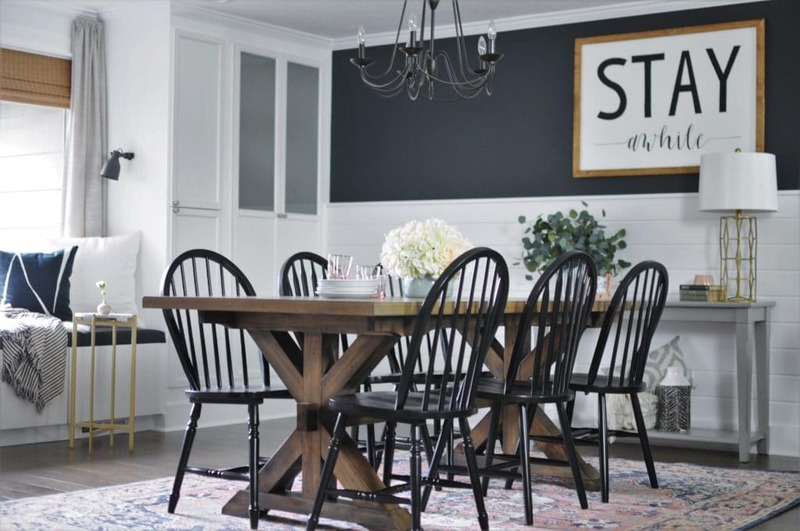 It is incredible to me how much a room can change with just a bit of paint and some new furnishings! 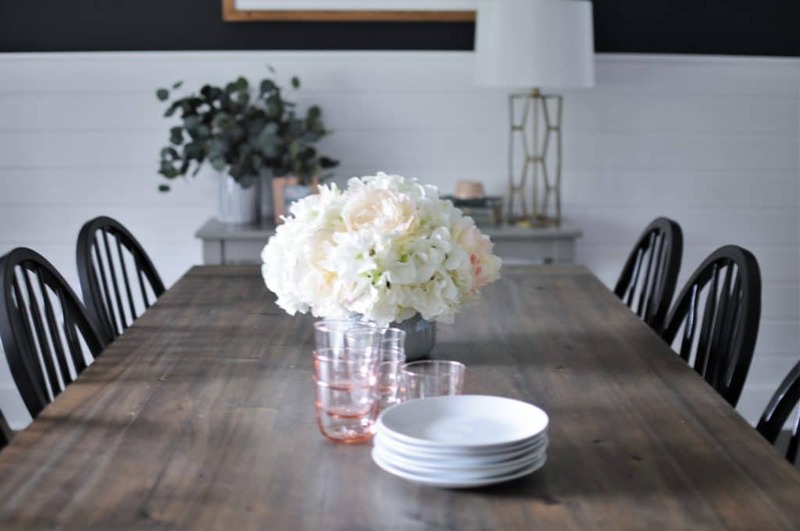 I hope you had fun following along on our dining room makeover journey, as a part of the One Room Challenge. Be sure to check out all the other fabulous reveals from the featured designers and guest participants this week. Tonight, you’ll find me sitting back with a glass of wine at my computer, reading through them and admiring all the talent. Seriously, it’s phenomenal. I can not say thank you enough to Chris, my husband, for all his hard work on this room, as well as our official sponsor, Pillowcubes. 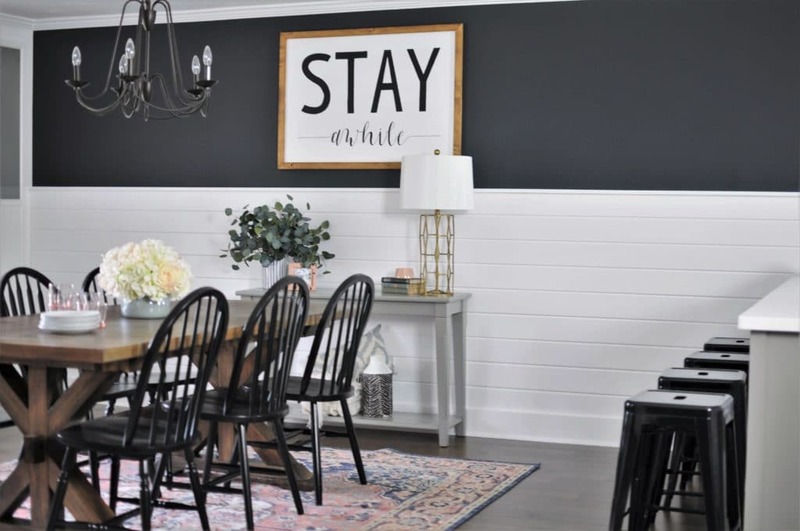 Without them, this room makeover wouldn’t have been possible! 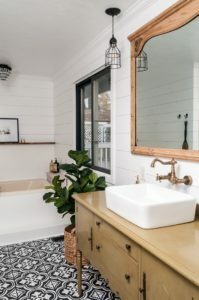 MODERN FARMHOUSE BATHROOM MAKEOVER – REVEAL! Love what you’ve done. 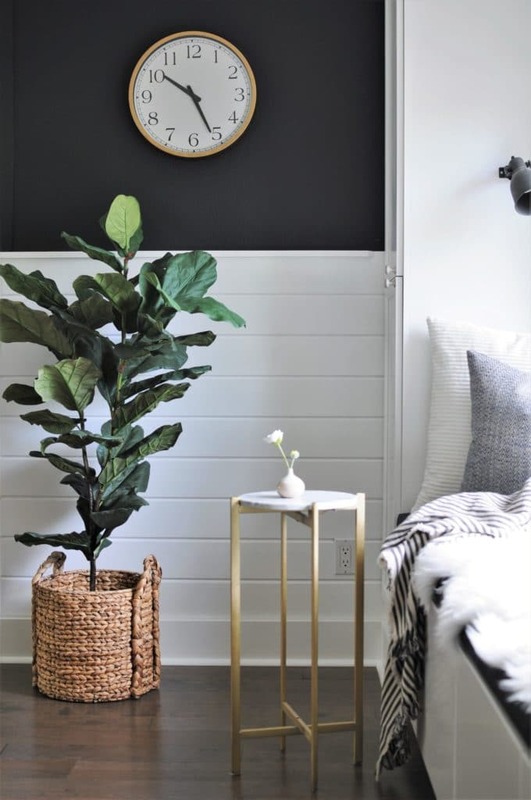 Im drawing inspiration from you with my own reno’s and am curious of the dark wall color and brand? So glad it’s inspiring you! 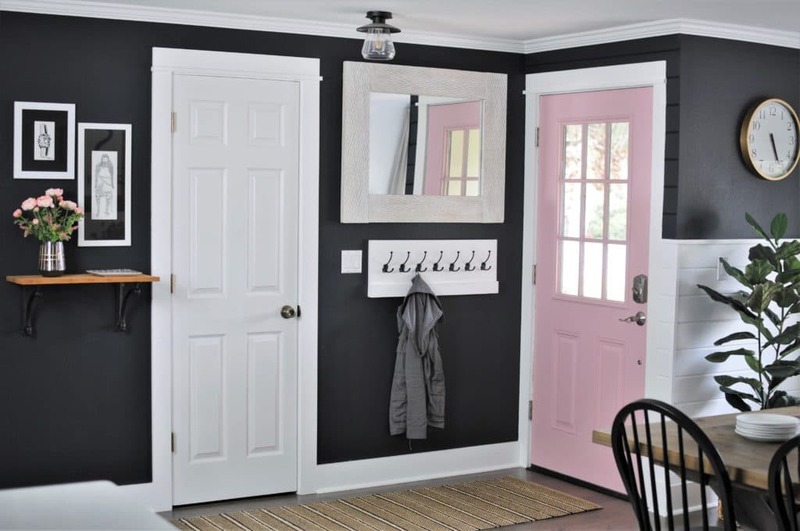 The dark wall is “Little Black Dress” from Behr. 🙂 It definitely shifts from black to navy depending on the light!